Bringing children to a retirement community can be an inspiring, enjoyable proposition for everyone involved. It is also fraught with trials that can ruin the experience. Bring joy to children and elders alike by planning your visit and preparing for challenges ahead. A senior community is probably unlike anything your children have seen before, filled with seniors, some of whom may be physically compromised or intellectually diminished. Explain to your children what they are going to see. If the person whom you are visiting has memory issues, make sure your children understand that they may not be recognized, or may be called by the wrong name. Consider getting a book out of the library that teaches children about visiting relatives in a nursing home. They include: A Little Something by Susan V. Bosak; Sunshine Home by Eve Bunting; My Grandma’s in a Nursing Home by Judy Delton. Older adults light up around children, even other people’s. Your children may be thrust into the spotlight, with people they have never met fussing over them. For some kids, this can be overwhelming and frightening. Let them know in advance that there is no danger in that, and run interference for your children if you detect that they are being overwhelmed. The opposite is possible, too: your children can find themselves with nothing to do. Make sure you have activities to keep them occupied – games, toys, etc. A bored child can lead to acting out that undermines the good tidings you meant to spread. 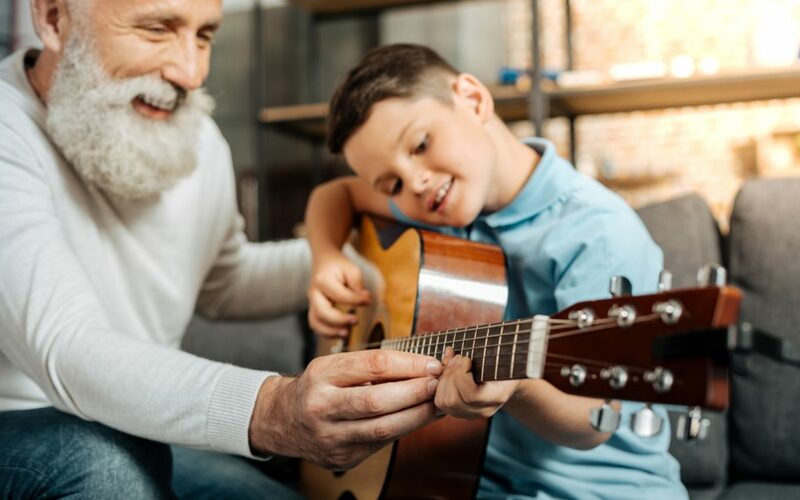 Nothing excites seniors more than children singing, dancing, playing musical instruments or otherwise attempting to entertain. Encourage your child to perform their talents for the residents and watch their faces light up. Think ahead about activities that would be enjoyable for the person you’re visiting and your children alike, and bring any supplies that might be necessary. This will help build a bond between your children and their elderly relative and facilitate an enjoyable experience for everyone. Have the children teach their elder how to use technology. A single visit is a valuable experience for the kids that will brighten their relative’s day, but continued visits are even more meaningful. They allow for a true relationship to develop or flourish, provide ongoing joy to the loved one and memories for the children to cherish the rest of their lives. Nye Health Services  offers seven communities in Eastern Nebraska and Wyoming, structured to meet the needs of their residents from independent living to skilled nursing care. A family-owned company with a rich history of connecting with the people they serve, Nye Health Services is open for visits anytime. Call  402.753.1400  to schedule an appointment at locations in Fremont, Lincoln, South Sioux City,  Norfolk, or  Jackson Hole, or  visit  NyeHealthServices.com  for more information.